Ian McInnes gave two different and fascinating talks at Bell House recently. We even had somebody attend whose great-grandmother had been born in Bell House in 1836. The first talk was centred on Dulwich’s Georgian heritage: the buildings, and the families who lived in them. He revealed a tangle of family connections with people moving into different houses around the village and he showed us how small Dulwich was in Georgian times. He told us about Thomas Wright, who built Bell House as a country retreat for his family, away from the noise and smell of the City of London. It was Wright who charitably installed the bell to help summon local men to fight fires in the hamlet of Dulwich. Ian’s second talk focused on Victorian Dulwich and again showed us that, just as now, Dulwich was a convivial and connected place. People knew each other, they worked and socialised together, and they brought their friends and family from other parts of the country to live in Dulwich. George Widdowson, for example, a jeweller who made swords, medals, and other regalia, lived at both Bell House and the White House (now replaced by St Austin’s, where James Allen’s Prep. School is based). He brought his sister and also a brother-in-law to live in Dulwich. 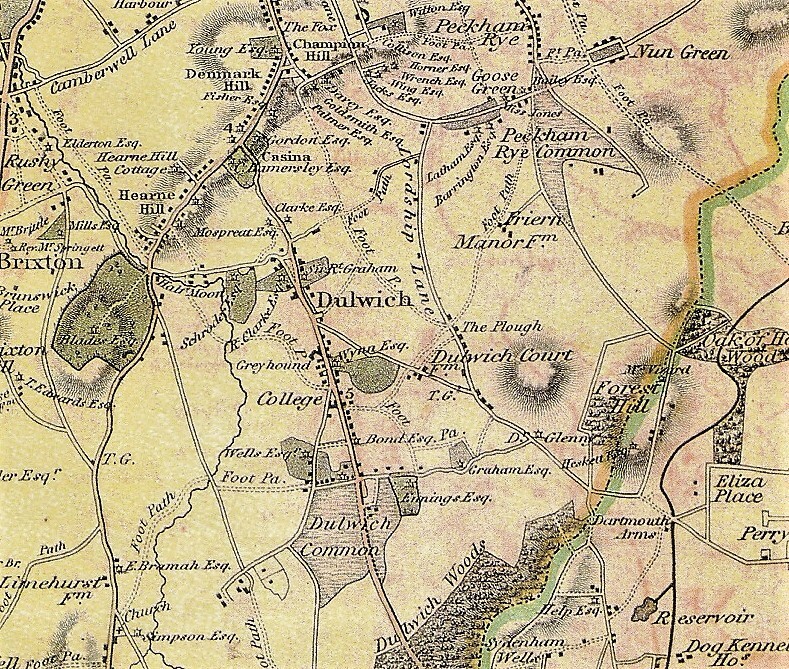 The pace of change in Victorian Dulwich was slower than in most of London and even into the twentieth century a small number of farms still supplied milk to local houses. But when the trains came the Victorian building boom made its mark here, especially in East Dulwich. Dulwich Village retained much of its open land, and still does, because the fields were converted into playing fields.